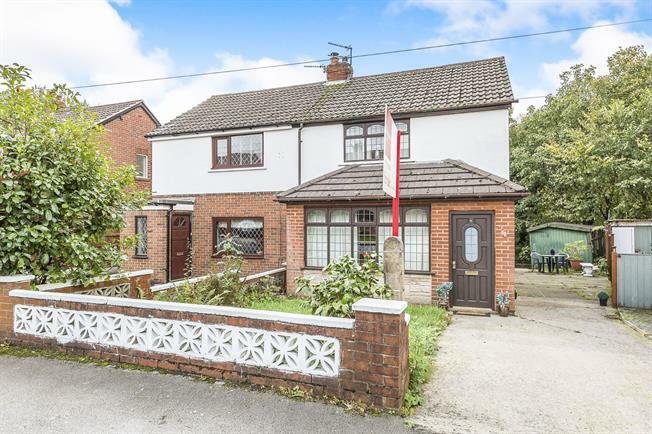 2 Bedroom Semi Detached House For Sale in Preston for Asking Price £129,950. Tiled floor. Part glazed door leads to hall. Laminate floor. Wooden staircase leads to the first floor accommodation. Part glazed door leads to lounge. Extended lounge displaying gas fire. Wood beam ceiling. Hardwood leaded double glazed window to the front. Laminate floor. Picture rail. Under stairs storage cupboard. Hardwood leaded double glazed window to the side elevation. Sliding door leads to inner hall. A range of white fitted wall and base units with complimentary work surfaces. Inset stainless steel single drainer sink unit. Gas cooker point. Plumbing for washing machine. Part tiled walls. Hardwood leaded double glazed windows to the side and rear elevations. Part glazed hardwood door gives access to the side. Step-in fully tiled shower area housing electric shower, pedestal wash hand basin and low level WC. Laminate floor. Loft access point (fully boarded with wall light points and hardwood double glazed window to the side) Airing cupboard housing gas combination boiler with over head storage cupboard. Hardwood leaded double glazed window to the side elevation. Hardwood leaded double glazed window to the front. Laminate floor. Stair well. Laminate floor. Hardwood leaded double glazed window to the rear elevation. Three piece cream family bathroom suite consisting of panelled bath, pedestal wash hand basin and low level WC. Half tiled walls and laminate floor. Air vent. Opaque hardwood leaded double glazed window to the side elevation.